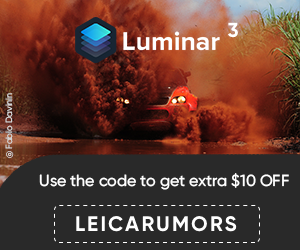 Leica Camera invites you to become a Creative Cloud Photography plan member today and save up to 20% on your first year! The Creative Cloud Photography plan membership includes access to Adobe Photoshop Lightroom CC and Photoshop CC. This offer is valid till 31.12.2015, for registered Leica customers. The newly enhanced Adobe Creative Cloud Photography plan provides the latest versions and updates of Lightroom CC, enabling you to organize, edit, and share your photos on your computer, on the Web, or on your mobile devices, plus Photoshop CC, so you can combine and retouch photos and create stunning visual effects. In addition, you also have access to an extensive library of video tutorials on numerous aspects of image processing with Adobe Creative Cloud products. These provide completely new ideas, tips and tricks and let you know well in advance whenever innovations for photographers are on their way from Adobe. 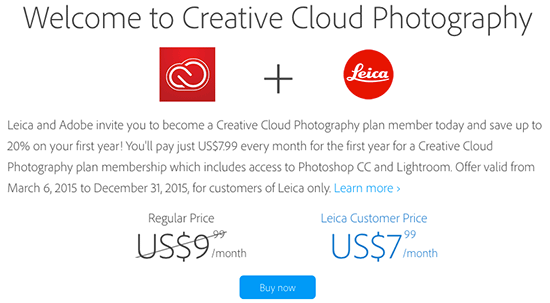 Please notice: This offer “Adobe Creative Cloud Photography plan” is not related with the regular software download of Lightroom which is available to Leica camera owners for the current camera models as a free download after registering their new purchase in the owner’s area. This entry was posted in Deals and tagged Adobe. Bookmark the permalink. Trackbacks are closed, but you can post a comment.